May was another month of great fabric for the Sew New to Me Virtual Quilting Bee. 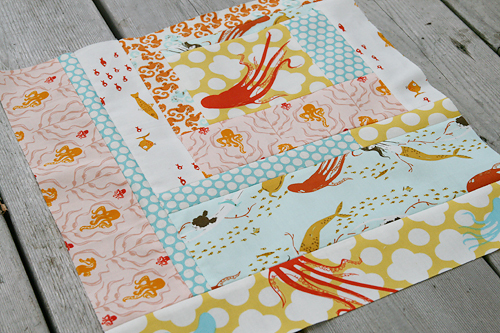 Kim of Sunshine Girl sent us some oh-so-soft Heather Ross Mendocino fabric as well as coordinating Kei Honeycomb. I just love the Mendocino line and it's getting harder and harder to find. Kim asked us to create wonky log cabins, staying toward the "simple" side of the design and paying attention to the fabric. I hope mine is simple enough...I sort of get carried away sometimes!